In a free ‘laissez-faire’ market, the interaction of supply and demand leads to price discovery. The market automatically adjusts supply and demand till an optimal or ‘ equilibrium’ price is reached. If apples are in demand the price of apples goes up, farmers grow more apples in response to the higher prices until there is an excess supply of apples which forces prices down to the equilibrium price. It is this self-correcting mechanism and constant price discovery that is the bedrock of a free market system. The system works efficiently, and no government intervention is required. The world has seen unprecedented wealth creation since the growth of free market economies. The evidence for free markets is overwhelming: All developed countries have markets that are free, but every country that is poor is because it suffers from obtrusive government intervention. Despite this evidence, political leaders continue to meddle with the economy and financial markets. There are several reasons for this. Often political leaders fall prey to the “ I know it all ” fallacy. 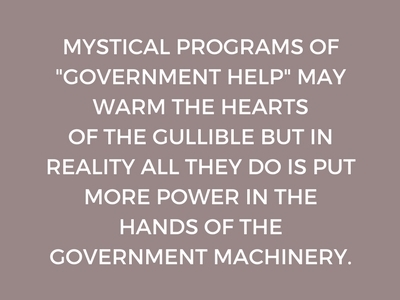 They assume that citizens are helpless, incompetent, dishonest, stupid and dangerous and need help from the “know-it-all” government. Additionally, power encourages hubris and leads to corrupting thoughts about the importance of the goal and the need for the leader to do whatever it takes to fix things. Finally, there are always selfish political motivations at play. It is unclear what motivated Mr. Modi’s unprecedented intervention in capital markets, but the results, like all government interventions, will be damaging to India’s economy and its financial markets. In a matter of two months, the word’s fastest growing large economy with its dynamic young startups and new vibrant companies was brought to its knees. Cash disappeared, business transactions fell by more than 40%, working capital dried up, and capital formation came to a standstill. But, instead of correcting course, Mr.Modi doubled down. In his Dec.31st address to the nation, the PM took state intervention to a dangerous and unprecedented level. He directed banks to decrease interest rates on loans for low-income housing by up to 4%, guaranteed an 8% return on deposits made by senior citizens, and increased credit limits for some sectors of the economy. Mr. Modi’s new ‘scheme’ of subsidizing loans to one group, while simultaneously paying higher-than-market rates on deposits to another group, is double jeopardy for an already stressed banking system. There are currently over 6 lakh crores of unpaid business loans and about Rs. 5 lakh crores of outstanding agriculture loans under the Kisan Credit Card (KCC) program. In the face of this reality, it is alarming that no one at RBI is objecting to the government adding another scheme which will undoubtedly further stress the banking system. By mandating that banks pay 8% interest to senior citizens, Mr. Modi has fixed ‘C’. Demonetization has increased ‘O’ for banks because employee time is being wasted in unproductive activities like exchanging notes and complying with tax authorities and enforcement directorates. And, certainly, ‘P’ is higher because of a stressed economy and the higher repayment risk associated with loaning money to low-income borrowers with no credit history. What we have here is the classic example of disequilibrium caused by government intervention in prices. The interest rate that banks will earn on loans, R, is less than their cost, the sum of C, O, and P. Mr. Modi’s scheme will force banks to charge 4% for loans that are costing them about 11%. A majority of these banks are public banks which are already stressed from almost Rs. 11 lakh crores of unpaid business and agricultural loans. And now the government is forcing them to lend money at a rate significantly less than the rate they are being forced to pay on deposits. Something has to give. There is no free lunch, and since the government does not produce anything, the only way it can hand out favors to one group is by stealing the resources to do so from other citizens. The subvention of just the interest rate portion by the government will cost taxpayers Rs. 3,000 crores for every million people that take advantage of the benefit. The irony is that both the RBI and the government know how poorly similar schemes have performed in the past. They must surely know that there is a huge repayment problem with the low-interest agriculture loans provided through KCC. There is a high probability that very little of the Rs. 5 lakh crores will ever be repaid. Most of the cheap money is being spent on consumption related activities and not on improving agriculture production. Mr. Modi’s ‘scheme’ for providing below-market-rate loans for low-income housing is likely to meet the same fate. It is hard to understand how low-income people will ever repay these loans when their incomes have not increased but their debts will have. And, just like the KCC scheme, government-guaranteed cheap money will likely get diverted to increased consumption instead of housing. Clever low-income senior citizens will borrow at 4% and reinvest that money bank into the bank at a guaranteed 8% interest and create a money making machine at taxpayer expense. Free and unencumbered capital markets are efficient at channeling credit flows to the most productive users of capital. But, if financial institutions are coerced into providing capital to a favored group it leaves less capital available for other, more productive, sectors of the economy. By forcing banks to provide cheap capital for low-income housing, Mr. Modi’s ‘scheme’ will hurt the nation’s growth by diverting capital away from businesses, capital investment projects, middle-class housing, commercial real estate and other productive sectors. The sad irony is that there is very recent evidence from the 2008 global financial crisis that shows that programs like this have disastrous results. Successive US governments under Clinton and Bush pushed for lower interest rates, easier credit terms to artificially boost affordable housing for all. As a result, the US mortgage market got distorted and mortgage repayment problems spiraled out of control leading to the worst financial crisis in modern history. The US stock market dropped 50% in 2008-09, and the American people lost almost $ 12 trillion ( Rs. 840 lakh crores) in net worth. The US, fortunately, had a robust capital market, and experienced professionals to handle the situation. India, unfortunately, has neither. Capitalism in India really only goes back about 25 years, and most Indians have ever experienced the pain of a bubble bursting. Most bureaucrats would be clueless on how to handle a financial meltdown, and the post-Rajan RBI has shown its ineptness in the way it managed the demonetization crisis. But the risk of a financial crisis is very real. The government still controls almost 70% of the banking system, and, over time, a combination of wacky schemes and a corrupt nexus of politicians, crony capitalists, and bankers has weakened the capital structure of public banks. Any systematic shock could have disastrous consequences for this sector and the economy. Mr. Modi would be well advised to step back from his instinctive desire to manage the economy. Managing a national economy is far more complicated than administering the economy of a state. He means well but is getting poor advice from sycophants and people under him who lack the courage to tell him he is wrong. Maybe he would be wise to listen to his critics instead, so he can better understand his mistakes and how to course-correct. Or, he could coerce back his economics teacher, Raghuram Rajan, who clearly would not have let any of this happen had he still been at the RBI. But whatever he does, Mr. Modi needs to understand that government intervention in matters of commerce has unintended consequences. When those mistakes become apparent, the government is programmed to prescribe additional policy fixes which then lead to new unintended consequences and on and on. The economy is too complex an ecosystem, and things spiral out of hand very quickly. Free markets do make mistakes, but they are good at self-correcting, governments are not and their mistakes keep compounding till the dam finally bursts.